Practice your throwing skills and have fun with friends or family at the same time, with Animal Bean Bag Toss. 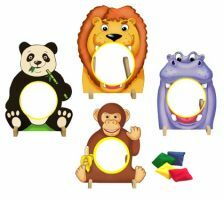 Each animal target is brightly colored with a large central hole and stand-up reinforcers; since they're freestanding, you can set the game up any way you like. Try placing them close together for a simpler game; or space them wide apart for a more challenging time - it's all up to you!